This is based on samples provided by the winey or an organization acting on their behalf. Prices noted are the Suggested Retail Prices. One note of caution in regards to my notes below. The samples were in small, 50ml, bottles from TastingRoom.com. Some of the wines seemed a touch soft or tired on the mid-palate and finish. I like these small bottles for sampling purposes, but they are designed to be sampled fairly quickly. The mini bottles are bottled from regular sized bottles in a “zero-oxygen chamber”, they are supposed to be consumed within four to six months. My samples had been rebottled about 5 1/2 months earlier, and I really think this was making them appear a bit “tired”. The more acidity driven whites seem to have held up much better than the reds. Since the samples were fairly small and questionable quality, I will not post scores for the wines. I will note, all the wines were well made with absolutely no flaws. I feel every wine, from a pristine bottle, would merit a solid recommendation. Do not pass on any of these wines based on my notes, I know I won’t. I would be happy to have a bottle of any of these wines with my evening dinner. 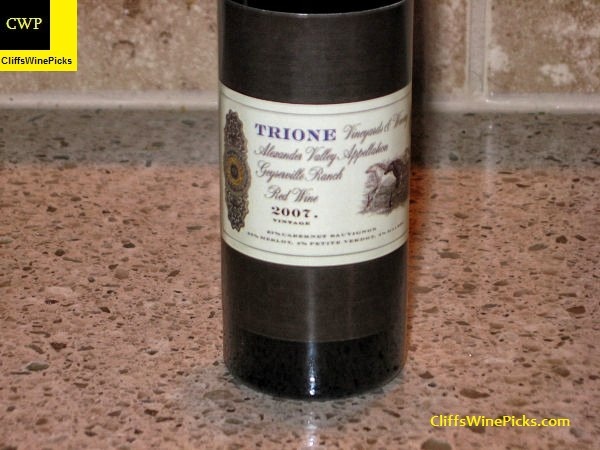 Trione wines are distributed in about half the country and also available on their website. 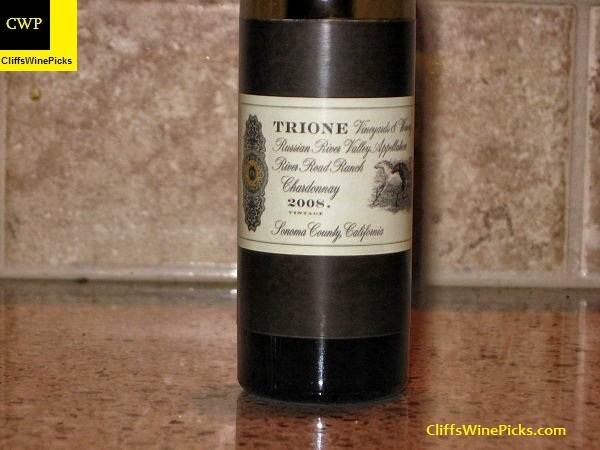 The Trione Wine Club offers significant discounts on wine and other perks, information is available here. 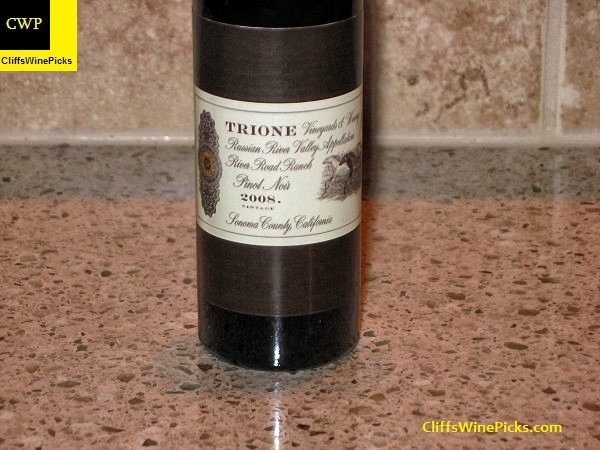 The grapes for this wine came from the Trione River Road Ranch in the heart of the Russian River Valley AVA. Sauvignon Blanc thrives here in the well-drained gravel and clay loam soils. The long and cool 2010 growing season extended into fall, allowing fruit flavors to develop fully. The Sauvignon Blanc was harvested the last day of September. 2010 was yet another challenging year in SonomaCounty for grape growing. In fact, rainfall and low temperature records for the month of July were set that had not been seen in 50 years. Yields were down in all varieties and growers and winemakers were wondering if the fruit would ripen at all, given the cool summer growing season. Then Mother Nature showed her fickle ways by sending late August temperatures rising to above 100°F and scorching any exposed fruit not protected by leaf coverage. The temperature rise hastened ripening and the grapes were harvested about two weeks later than normal. 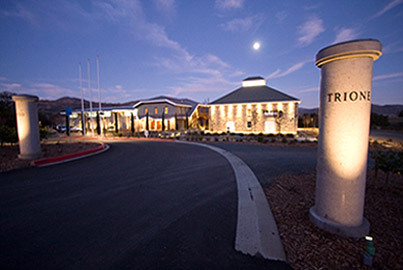 The 2010 Sauvignon Blanc was made in the traditional method of tank fermentation and barrel aging. Neutral white French oak barrels were used for the barrel aging. Total production was 1,054 cases and the final alcohol was 14%. The wine is a very light yellow to straw color, just a touch more color than water. The fresh and Spring-like nose has gooseberry, honeysuckle, melon, lime zest, fresh cut grass, minerals, sea breeze, and a touch of baking spices. This has just a touch over light body, is dry, and has juicy, citrusy, acidity. The mouthwatering palate has nice spice, gooseberries, melons, herbal notes, and lime. The finish has nice length and again has a nice mix of citrus, spice, and herbal notes. This is like Spring in a bottle. 2008 by all accounts was a season of extremes. It began as a dry winter with slightly early bud break, which was followed up by the most extreme frost events that the Russian River Valley had seen in years. Full frost protection was needed as well as a lot of praying. The summer was moderate with long warm days and cool nights. With a small crop set and a heat spike in late August, the harvest was set in motion. The heat sent sugars climbing and the vineyard crews scrambling to get the fruit in as quickly as possible. The Chardonnay harvest was about one week ahead of the previous year. 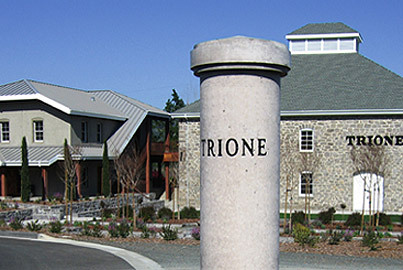 Traditional winemaking is the focus with Chardonnay at Trione. Like the great wine estates of Burgundy, the wines are made with grapes that are hand harvested, whole bunch pressed for gentle juice extraction with the resulting juice racked to barrels. The barrels are 100% French oak with a mixture of new, one and two years of age. The lees from the previous vintage are used to initiate fermentation. The wine then spends the next few months fermenting with the completion happening sometime the following spring. The wine was aged for 13 months in oak barrels, 40% new. 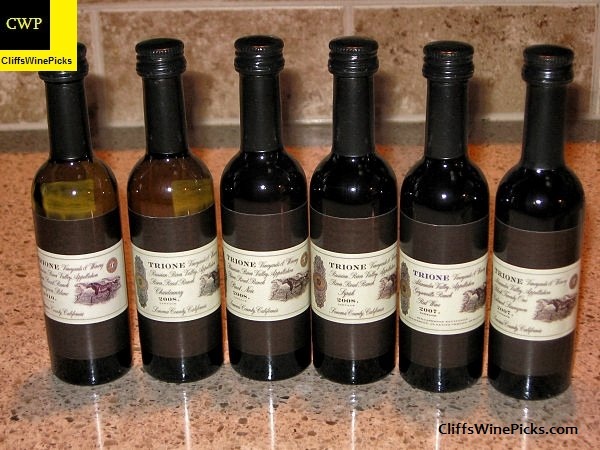 The wine is a pale golden-yellow color with a slight greenish tint. The nice nose has apples, pears, hazelnuts, baking spices, spicy oak, and a touch of lemon zest. This has medium body and has good acidity. On the palate there are baked apples, lemon zest, and a touch of nuttiness. The finish is fairly long with tart apples and spice being joined by a slight herbal note. 2008 by all accounts was a season of extremes. It began as a dry winter and slightly early bud break, which was followed up by the most extreme frost events that the RussianRiverValley had seen in years. Full frost protection was needed as well as a lot of praying. The summer was moderate with long warm days and cool nights. With a small crop set and a heat spike in late August, the harvest was set in motion. The heat sent sugars climbing and the vineyard crews scrambling to get the fruit in as quickly as possible. The Pinot Noir harvest was about one week ahead of the previous year. Traditional techniques such as such as open top fermentations and hand plunging the cap during primary fermentation were implemented. To accentuate the fruit component, twenty percent of the grapes were added whole cluster to the bottom of the fermenter. The wine was aged for 13 months in oak barrels, 45% new. A total of 1,295 cases were produced. The final alcohol was 14.3%. The wine is a light ruby red, considerably lighter at the edge. The inviting nose has black cherries, earthy underbrush, baking spices, dried herbs, mushrooms, and a touch of cola. This has medium body at most, soft but persistent tannins, and very good acidity. The palate has earthy black cherries and spice carrying most of the load. The finish has decent length but could use a touch more oomph. 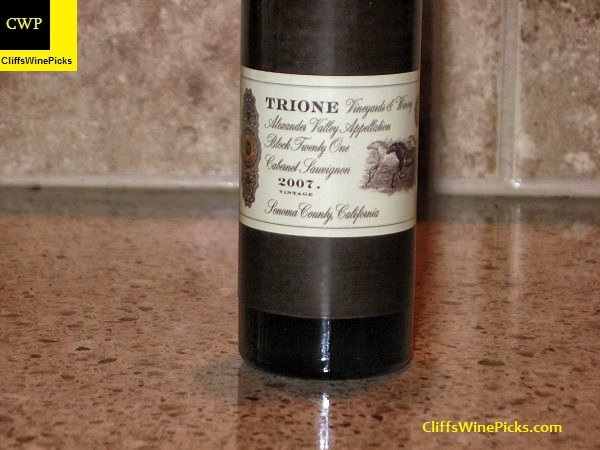 Trione Syrah grows in a single block planted with two clones, 470 and 877. 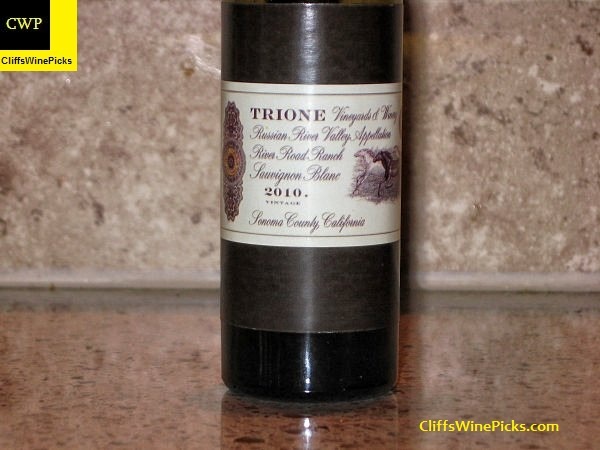 The mild 2008 growing season allowed slow ripening with full development of rich flavors and soft tannins. Ten tons of grapes were hand harvested on October 8th and crushed the just-completed winery. This Syrah was made with many of the small-batch techniques used with Pinot Noir: fermentation in small, open-top fermenters with a larger portion of whole berries, hand plunging the cap four times daily for maximum flavor and color extraction. The whole berries contributed deep blackberry fruit character and added complexity. There were 678 cases produced and the final alcohol was 15.3%. The wine is a deep ruby red color. The enticing nose has blackberries, plums, warm baking spices, white pepper, meat juices, violets, and earthy underbrush. This has medium body, fairly solid tannins, and good acidity. The palate has very nice spicy berries with white pepper, earthy elements, and a meaty quality. 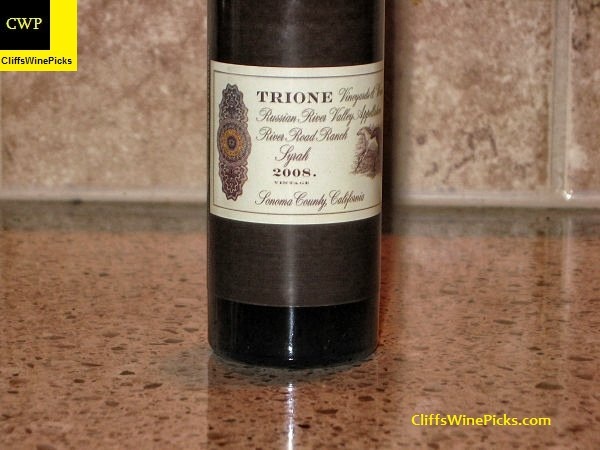 The finish has very good length and again leans on the spicy, peppery, earthy berries. The Block 21 Cabernet is a single vineyard selection from the Trione Cloverdale Ranch, situated on the western flank of the MayacamasMountains, in the northern portion of AlexanderValley. This classic Bordeaux blend includes 10% Merlot from the Geyserville Ranch and 2.5% each Petite Verdot and Malbec, both from Cloverdale. After a long, mild growing season, the grapes were harvested by hand, each variety separately fermented, then barrel aged for twelve months. Once the final blend was determined, the wine was returned to barrel and aged for an additional twelve months to ‘marry’ the varietals. The French oak barrels (45% new) used from coopers Taransaud, Vicard and Bossuet. Only 733 cases of wine was produced and the alcohol is 14.5%. The wine is a touch darker than a medium ruby red color. The very appealing nose has cassis, cedar, baking spices, cherries, minerals, dried herbs, and some earthiness. This is medium to full bodied with fairly solid, ripe tannins, and good acidity. The palate has nice cassis and cherry up front with baking spices, dried herbs and some earthiness coming in late. The finish has nice length and briefly leans on the fruity components before the savory notes take over. I would have liked a touch more fullness on the palate which gets a bit lean. The “Red Wine” is a classic Bordeaux blend of Cabernet Sauvignon, Merlot, Petit Verdot and Malbec. This wine was blended to show the complexities that exist in the Alexander Valley Appellation. The wine is composed mainly of Cabernet Sauvignon from Nervo Ranch. The Merlot is from the Geyserville Ranch, the Petite Verdot and Malbec are from Cloverdale Ranch. The varietal breakdown is 57% Cabernet Sauvignon, 35% Merlot, 4% Petite Verdot and 4% Malbec. Each variety was fermented separately in small open top vessels. A total of 2,435 six-packs were produced with a final alcohol of 14.9%. The wine is a deep ruby to maroon color. the slightly subdued nose has cassis, warm baking spices, dark chocolate, dried herbs, black cherries, and a bit of earthiness. This has a full body, fairly solid tannins, and decent acidity. The palate has nice cassis and plum notes up front with dried herbs and some dark chocolate coming in on the back end and carrying on through the nice finish. Nicely balanced but I’d have liked a touch more complexity.